It’s been a long time since we had an entry in our series of park-based video games. And as you no doubt have noticed, the world financial markets are reacting to this oversight. Unemployment figures have risen sharply, and America’s students are now verifiably stupider than they were before. So, here to set everything right, we return once again to that hallowed virtual world of recreating a fake environment inside a computer. Why go on vacation when you can do the same thing from the comfort of your PlayStation, and have full control over the ride vehicles to boot? I was reminded this week by one of our readers (James, you know who you are) that I never got around to talking about what happens to be my all-time favorite Disney park video game. Forget that Disney World Explorer CD-ROM thing. This is the real deal for the true fans. A dozen years later, I’m still amazed it got made at all, and with this level of quality. 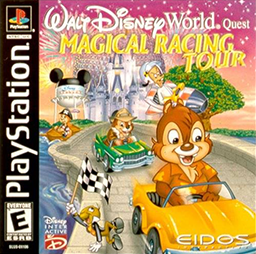 It’s an innocent-sounding title: Walt Disney World Quest Magical Racing Tour. It sounds like just another lame knock-off, with a vague “Magic” theme and a built-in horde of quasi-Disney fans willing to accept any half-baked re-theme of an existing game engine, so long as it has a castle on the cover and a sparkling trail of pixie dust that follows your mouse cursor. But this game is not for them. On the surface, it’s a racing game (think Mario Kart), with famous Disney characters like Jiminy Cricket, Chip, Dale, and Otto Plugnut. Okay, Chip and Dale are the only recognizable drivers, and Jiminy is just there to wave the checkered flag. The others are all vaguely chipmunky, and may have come from the Rescue Rangers TV series, but I couldn’t be bothered to verify this. So far I’m not exactly blowing your socks off, am I? But let me tell you about the levels. 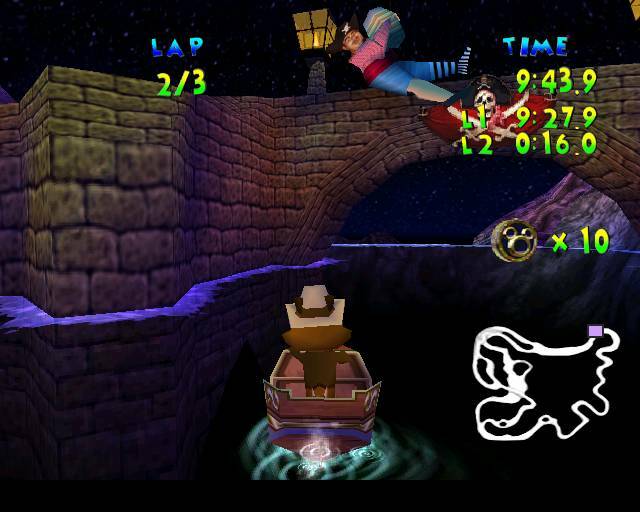 There are 10 straightforward racing courses, and 3 bonus levels that are about collecting coins. Some of the levels you would expect: Haunted Mansion, Pirates of the Caribbean, Jungle Cruise. But they’ve also got some surprising variety in here. 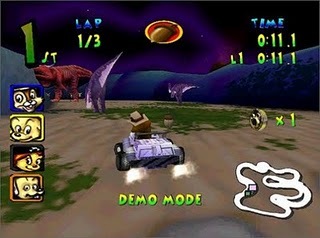 There are levels based on Dinosaur, Blizzard Beach, and the Tomorrowland Speedway. The remaining levels are Rock’n’Roller Coaster, Big Thunder Mountain, Splash Mountain, and Space Mountain. The coin levels are Test Track, Typhoon Lagoon, and Disney Studios. And these levels are not just evocative of the rides. They quite simply are the rides! There are some minor liberties taken with the courses to ensure that they’re long enough to provide a challenge, but the level of detail built into them can only be appreciated by true parkeologists. The background figures in Pirates actually say the lines as you whiz past. The library busts in the Mansion actually follow you as you drive past. There’s no Aerosmith soundtrack to Rock’n’Rollercoaster, but everything else is there, right down to the red carpet finish line. As reader James points out, when a game includes the hairy leg pirate, you know it’s an instant classic. No fear of evil curses, sez you. Properly warned ye be, sez I. This game is probably the closest we’ve come to a virtual Disney environment that you can explore, outside of virtual-toad.com. And if that’s not enough, many of the courses contain hidden shortcuts to discover, that take you into unexplored but familiar parts of the ride. These are a true joy to figure out. The Haunted Mansion shortcut is especially deceptive (and a real trip when you catch it). And if all that isn’t enough, the ride vehicles match the course. Sure, you’re in typical speedway race carts for the Tomorrowland Speedway section, but on the Jungle Cruise and Pirates, you’re in high-powered boats. You drive a log through Splash Mountain, a steam engine through Big Thunder, and some kind of rad snowmobile through Blizzard Beach. Look closely: See the Ice Gator? Chew on that, Fanboy! But even if none of that had happened, the game would still be awesome, because it has phenomenal game play. 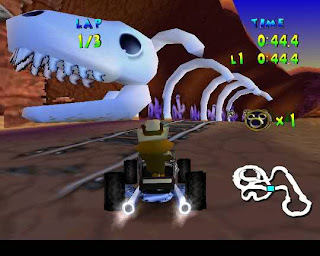 There are good racing kart games, and there are bad ones. 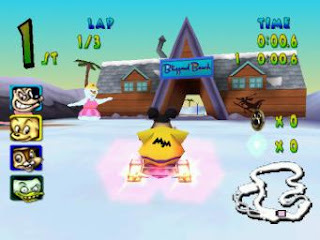 Magical Racing Tour is highly playable, and actually quite challenging. Even once you figure out the shortcuts, it’s no cake walk. Collecting all the coins in the bonus levels requires a whole different set of skills, and is just as fun and detailed. 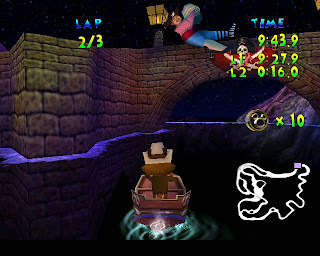 Heck, you should play the Disney Studios level just for a chance to drive around MGM without that awful Hat blocking everything (the game predates the 100 Years of Magic celebration). And just to go one step further, there are hidden items and special maneuvers that can be performed in each level to collect bonus trophies, which you’ll need to do in order to complete 100% of the game. Okay, he’s driving the wrong way for Walt Disney World’s Big Thunder. Quibble if you must. In a way, the game was almost too fanboy. Surely casual gamers couldn’t care less about seeing the exact same snowman in the Hawaiian shirt from the real water park, or gets excited that the ghostly ballroom dancers are backwards, such that the woman is leading (just like in the real ride). And Chip and Dale aren’t exactly the most popular characters in the world, let alone Amanda Sparkle and Bruno Bristle. Oh yeah, I think there’s a story to it. Something about Chip and Dale needing to collect pieces of the fireworks machine. You won’t care about that part. But you’ll love it when you come face to face with a giant python on the Jungle Cruise. He’d love to get a crush on you. There are still a few more video games in our vault, and I’ll return to them when I get a chance, but I couldn’t let the Magical Racing Tour remain in obscurity. It was originally released for PlayStation, Dreamcast, PC, and I think Game Boy Color. It’s also been emulated on the web, so you can at least give it a shot, and if you’re truly industrious, I believe it can be downloaded in zip format from google docs. This entry was posted in Theme Park Life and tagged Big Thunder Mountain, Blizzard Beach, Dinosaur, Haunted Mansion, Pirates of the Caribbean, Rock-n-Rollercoaster. Bookmark the permalink. I had totally forgotten about the Test Track chompers. Though now that I think about it, I may be confusing them with the chain chomps from Mario Kart. I believe you failed to mention that this game even used some original music tracks from their rides– at the very least the famous “Yo Ho, Yo Ho,” “Zip-a-Dee-Doo-Dah,” and “Grim Grinning Ghosts” do a lot to up the “wow” factor of their respective racetracks. Was Space Mountain’s song an original one? I remember it being sort of heavy and intimidating, but cool! Dionsaur and Jungle Cruise got sort of drummy tribal sounding soundtracks. And the Test Track coin collection board was sort of scary, with all kind of nasty chompers just waiting to flatten you and bless your family with extra Disney Dining credits. I was waiting for this article too, glad someone thought to remind you! @Richard, it sounds like a costume opportunity for Tokyo Disneyland’s Halloween party (it would be lost on people here in the states). @FigmentJedi, could you actually race as Jiminy? For some reason, I’m remembering him waving the flag to start you. @Brian, I think it may have been YOU I borrowed the game from! Though I don’t think we ever raced against each other. Yeah, I don’t know whose idea it was to make Chip, Dale and Jiminy the only pre-existing racers. Everyone else is OCs. I LOVE THIS GAME! I still have it and kept my PS2 just so I could play it. In my family no one could beat me. I was the racing master!!! I think it’s because I used the amazing Tiara Damage. I think it would be funny to design shirts with all the racing characters and wear em into the parks! I used to play this game until my hands no longer functioned (and I’m not even a big video game fan). It is absolutely fantastic. I haven’t played it since at least 2004. Thanks to your post, I think it’s time to dig out the Playstation and go for a spin. Thanks.